With Ashes of the Singularity now officially released, it’s time to think about where to take the game next. This is going to be long and rambling so please bear with me. The game seems to have been reviewed by 3 types of reviewers so far with their scores reflecting opposing views on what a PC game in 2016 should deliver. The most common reviewer has been the ones who consider the campaign as the primary single player experience. These are the reviewers who give say Homeworld: Deserts of Kharak a 9/10 because of its engaging story while giving Ashes a lower score (sometimes much lower) because its campaign is relatively bare bones. While I personally object to that criteria in a strategy game. Who am I to argue with their opinion? Plenty of people feel this way now. The second most common reviewer is the one who actually plays RTS games on a regular basis. They’re the ones who usually like Ashes of the Singularity and give us a 9/10. 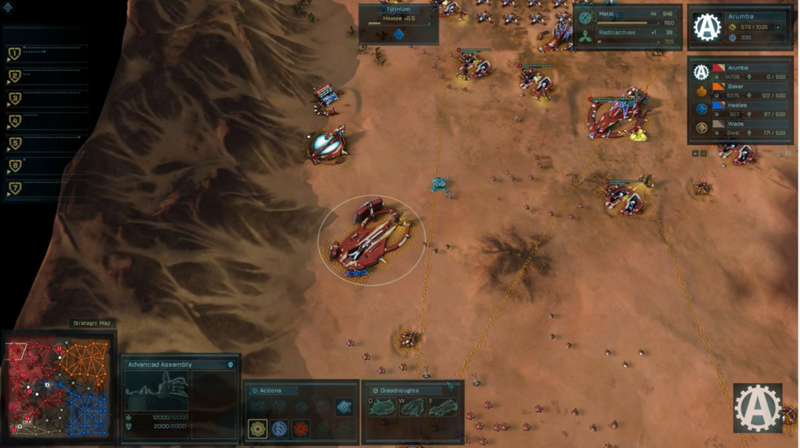 What matters to them is that the game, on day 1, has a smart AI, lots of skirmish maps, a built-in ability to easily add more scenarios, strong modding support, a future proof engine for expansion and a good set of initial units (16 right off the bat). These are the reviewers that I have relatively little use for. They’re the guy who played strategy games way back when but nowadays is mostly messing with Dota 2 or Overwatch and thus really has no business reviewing the game in the first place but got assigned to do it because no staff writers had the minimum GPU to run the game. They’re the ones who don’t actually play Supreme Commander: FA or Total Annihilation anymore but remember thinking how cool they were back in the day and how weak Ashes seems, to them. My problem with this reviewer boils down to this: As good as SupCom is, it’s never going to be updated again. Ever. So unless you are personally playing one of these games, and they’re not, it’s a disservice to compare to a 1.0 game to an older game that has had years of updates but isn’t, as a practical matter, something someone is going to go and play. Now, if that person is actually playing SupCom: FA (and they’re not, they should be playing FAF and FAF players are not in this category) that would be one thing. But they’re not and we know because they would be instead talking about FAF. All in all, I’m annoyed with the relatively low quality in game reviews these days. Getting a review from a metacritic site where they played .4 hours (yes, we know who you are) is exactly why people have trust issues. Topic #2: What makes games last? Well, as I write this, Sins of a Solar Empire has climbed over the years to having typically around 800 to 1000 people playing. But it didn’t happen over night. And don’t even get me started on GalCiv I for Windows. 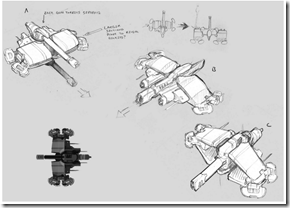 I still wonder what would have happened if Master of Orion 3 hadn’t crashed and burned. GalCiv I was not..shall we say, initially great (no campaign). So what matters? Those are the 3 pillars. Miss any one of them and your strategy game better be super strong in one of the other categories to survive long-term. Replayability can be achieved in many ways, none of them easy. Good AI, a good multiplayer community, Every game feeling new and different. These are crucial. New Content has to keep coming in. 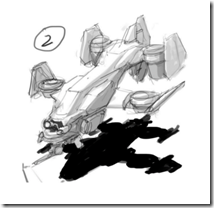 When Sins of a Solar Empire shipped, it had a total of 11 units per faction. Today is has 21. Almost twice as many. Sins had no diplomacy, starbases or Titans originally. That all came later. People also forget (or don’t realize) how rough Supreme Commander 1.0 was. 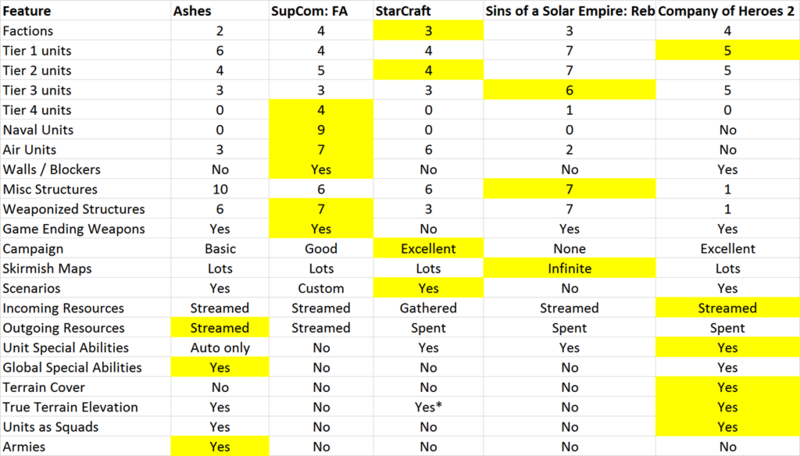 When People talk about SupCom they really mean Supreme Commander: FA not Supreme Commander 1 or even Supreme Commander 2. Modding no developer can keep extending a game forever. The best games foster a strong modding community over time. Modding doesn’t come initially. You have to have a good, strong player base first. Topic #3: What makes a “good” RTS? My chart here is, by no means, objective. It’s my personal opinion on the matter. It doesn’t represent Stardock or some consortium. It’s just my 2 cents. I have highlighted the areas in which I think a particular game is the best. 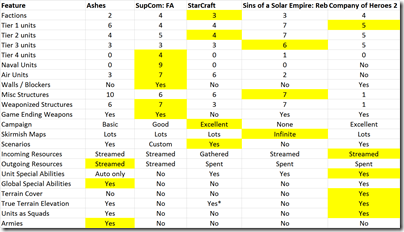 So for instance, even though SupCom has 4 factions now, I feel StarCraft’s faction diversity is superior even though it only has 3 factions. 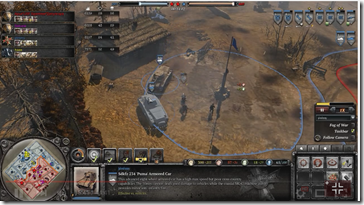 Similarly, I personally prefer the balanced resource design in Company of Heroes to anything currently released. But you look at the above chart and even by my own standards, my other favorite RTS’s are “better”. 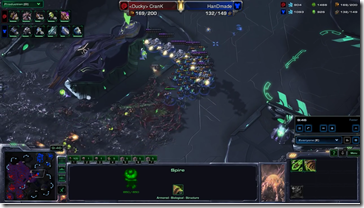 As much as I like StarCraft, it’s gameplay has moved away from the style I enjoy. It is far too twitchy for me. I have an 88 apm and that used to be enough to put me into Diamond. But Legacy of the Void put the game out of anything I would enjoy. It’s an action game now for me. As much as I like Supreme Commander (more specifically, FAF) I have played it out. I am not as big of a fan as some of its die-hards that insist on review bombing Ashes (which hasn’t improved my opinion of some elements of that community, come on guys, Ashes’ success will eventually let you bring your entire game to it). For me, Supreme Commander is hopelessly over-engineered for a new player and as anyone who watches Gyle’s streams (which I do) knows that nearly every game ends in Nuke duels or Experimentals. That’s only fun (for me) so many times. Ashes, btw, would have the exact same problems if development for it stopped. However, it wasn’t Ashes that killed SupCom for me. It was Company of Heroes. After seeing the elegant hard counters in CoH, it’s really hard to go back to a game in which people tend to build masses of the same unit. I never enjoyed on a map like Open Palms building up a dozen plus tech-1 land factories. And ironically, Ashes has some of the same problems which I’ll talk about in a minute. 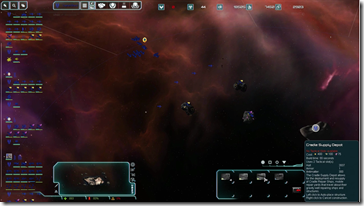 Sins of a Solar Empire on the other hand is just a game I’ve played so much over the years. There’s nothing wrong with it per se. But I’ve just played it too much. It also is single threaded which keeps its future expandability tough. I look forward to a Nitrous Sins game. I still play Company of Heroes 2. But it is a fundamentally different game for me than Ashes. But as my chart above makes clear, Ashes still has a ways to go. And yet, I also think it is the definite RTS game people should be buying today. Why? When I look at the things that I think Ashes needs work on, they are all doable things that simply need time (and money). People will ultimately vote with their wallets on what they want so consider this: If not Ashes, then what? One trend we want to continue is that these units aren’t simply “Better versions” of the previous tier. You can always tell someone who doesn’t know the game very well when they say it’s about building the biggest swarm. 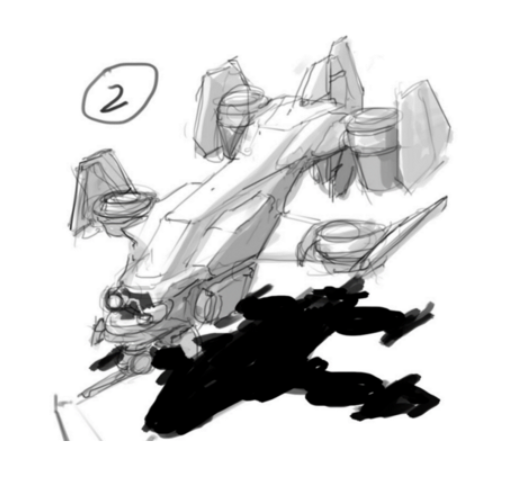 A single Zeus or Avenger will make short work of swaths of Brutes for instance. Each of these units will be very strong at certain things but also be very vulnerable. 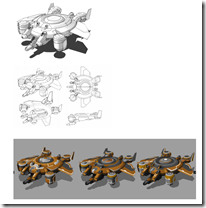 In Ashes, units are intended to be tools. They’re not different sized hammers. Community features comes in the form of modding. You have to make it so that people can create and share scenarios and map that work both in single player and multiplayer with friends. The ability to add new units and expand the game from the community (you want your FAF total conversion, then go ahead). Similarly, replays, observer modes, 64 player mega maps, etc. These are all things that will need to get into the game. Time is just something we can’t do anything about. Half the market can’t play the game because of the 4-CPU core, 2GB of video memory requirement. This was a decision we made and we debated on whether we’d be better off sitting on the game for another year and polishing it or releasing it so that the early adopters could get a start on growing things. As is, we had to limit things to 6 players to get the performance fidelity we wanted on our minimum spec (and even then, minimum spec players make 6 player MP games very unreliable imo). As we develop better ways to test performance we will eventually be able to open up much bigger maps with specific hardware requirements. Obviously, how fast we can go down the path depends really on player demand which is measured in sales. It’ll be a long time before Ashes is a top-seller for no other reason that you can’t chop off half the market with hardware and get there. But hopefully, those with the hardware to play the game will give it a shot and get their friends to. 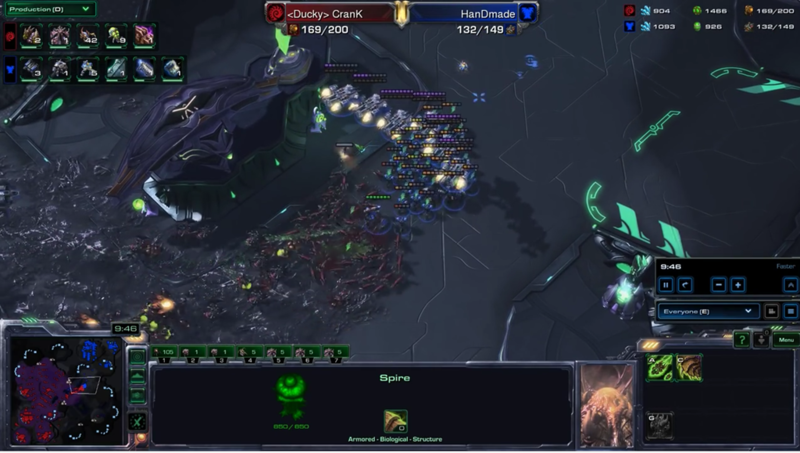 Every RTS you just listed (Starcraft excluded because it's so lame it never reaches this point) becomes an absolute mess in the lategame on massive maps. Ashes is a nightmare to manage logistically due to the lack of tools available on a large scale (area commands ftw). It's much, much easier than everything excluding PA, however. SupCom stagnates unless the players on each side are near perfectly balanced. It's the same game being played a thousand times, basically. Sins is just a complete nightmare on large maps due to the same lack of tools as Ashes. 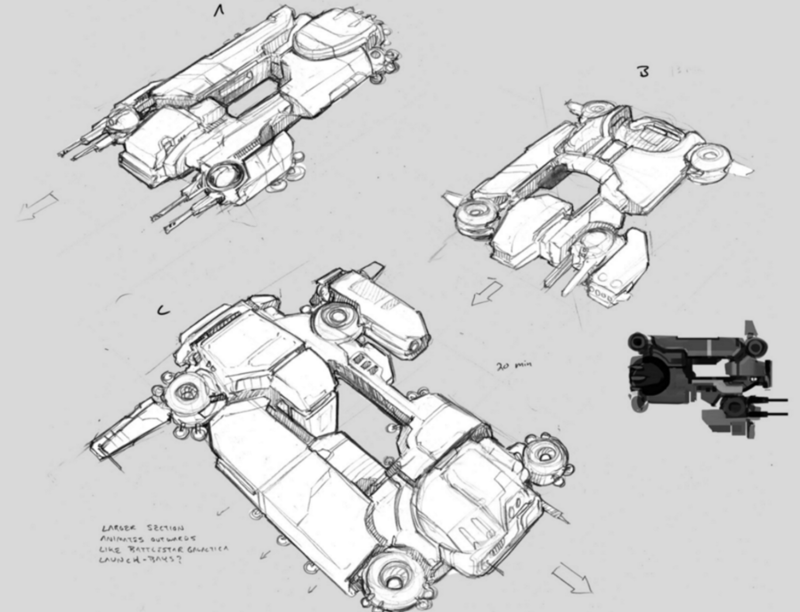 It also tends to lack the massive game-ending super weapons that SupCom uses to *spice* the late game. PA, which you failed to mention, also has late-game, huge map issues. The mechanic meant to keep the lategame *spicy* or at the least an interesting conflict was planetary destruction. The idea that the map would get smaller and smaller as the game went on, and well balanced systems would end with two or three well-developed teams slamming into eachother in colossal fashion on a contested planet. Unfortunately, the Annihilaser kinda ruined that idea when they gave it zero cooldown. Imagine a rapid fire death star. Interesting, to be sure, but it still stagnated, just like SupCom. Company of Heroes, afaik, doesn't have a late game. I was advised against participating in that particular RTS by some good friends of mine, so I have no experience there. TBH, I don't think that you can say Ashes needs time when Stellaris is about to blow everyone else out of the water in sales. That is the price of going for a *tech-savvy* approach and neglecting the game, but ya'll knew that to begin with. Can't wait to see the next generation of RTS games in twenty years lol. I look forward to a Nitrous Sins game. Sorry, but I stopped caring about anything else you said when I saw that. Taking it as confirmation. Sins was perfectly fine on large maps I found because its empire tree was useful in being able to locate specific planets and it had the larger zoom out. It also had other tools like being able to search for specific ship types. Ashes isn't on that scale though so I'm not sure adding sectors to the empire tree would help. I don't find it hard to navigate any of the maps in the game so far anyway though. 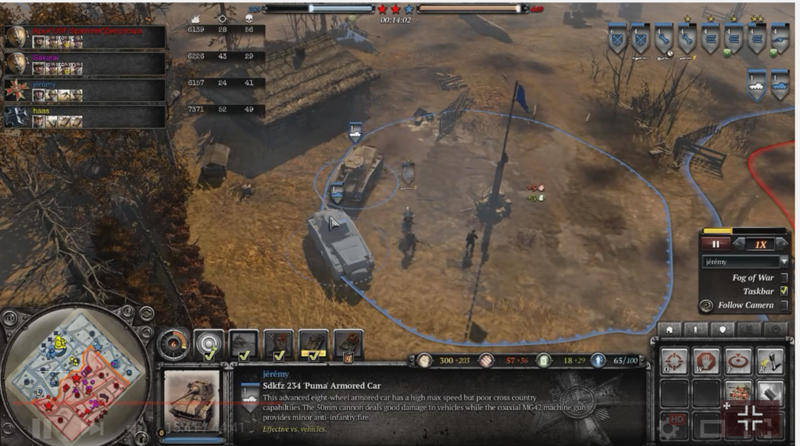 Company of Heroes has a late game but it's not comparable to these larger scale games. Not sure why you're bringing up Stellaris - it's a completely different genre of game. 1. It's unlikely many of the review bombers are going to view this post. Since it's impossible to prevent reviews by people with overly strong bias, it seems to me that the gaming community needs a reality adjustment. An average score of 7/10 should be considered "pretty good", not awful. 9/10 should be "wow, these guys nailed it", with 10/10 being "I can't think of a single thing wrong". Because you're going to get the haters, it will drag the score down to, say 7/10, and the gaming community needs to adjust to the new scale. It will probably never happen, but at least the root cause is identifiable. 2. You mentioned 3 pillars. I'm very surprised to not see "gameplay" or "UI" somewhere in that list. When a game is tedious, overly complex (or overly simple), has bad pacing, or poorly executed mechanics, it will turn people off. Now you might argue that these are sort of short-term issues that can be patched. I'd argue that in today's ADHD high information volume world, first impressions are far more important than they used to be. Surface experience is vital. Just look at memes. Probably half the population, teens and millennials especially, base who they might vote for for political office upon what they see in photos with 10 word phrases, whether true or not. If you do not impress them in the first 10 minutes, it's a good bet you will never get their attention ever again. 3. 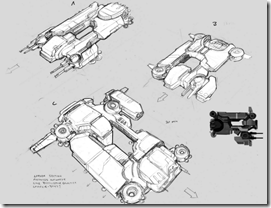 Scenarios, campaigns, maps, custom units, mods to tweak CSV files, these are all nice. But they are surface-level mods. I think modding support should eventually be much deeper: custom army behavior, stances/commands, global abilities, research, AI personalities/strategies/tactics. Can you imagine how awesome it would be for some clever modder to come up with a way to effectively re-enact the final battle scene in Ender's Game with a rotating formation at the army level? Or build a set of units and strategies based upon stealthed units? And for it to work the AI has to be moddable to be able to make use of custom capabilities as well. Admittedly, what I'm asking for is a level of power that would allow modders to make the gameplay way different from your vision of Ashes. But that would light a fire of creativity that will keep the game relevant and interesting indefinitely. Me thinks you don't know what Stellaris is. It's EU in space, Mered. You mentioned 3 pillars. I'm very surprised to not see "gameplay" or "UI" somewhere in that list. When a game is tedious, overly complex (or overly simple), has bad pacing, or poorly executed mechanics, it will turn people off. Now you might argue that these are sort of short-term issues that can be patched. I'd argue that in today's ADHD high information volume world, first impressions are far more important than they used to be. Surface experience is vital. Just look at memes. Probably half the population, teens and millennials especially, base who they might vote for for political office upon what they see in photos with 10 word phrases. If you do not impress them in the first 10 minutes, it's a good bet you will never get their attention ever again. I would put Gameplay into Replayability. 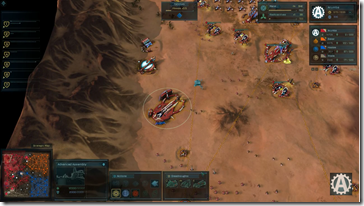 UI in a new strategy game doesn't spring up from the start. It requires, unfortunately, months, if not years, of iteration. When I see people bring up SupCom UI I can't help but smile because they clearly don't remember what a mess SupCom was. I was there. I worked with Mike Marr who designed FA and he is the one who brought good UI to SupCom (which he also brought to Demigod). Sins had an unusually good UI out of the gate which has only gotten better over time. Scenarios, campaigns, maps, custom units, mods to tweak CSV files, these are all nice. But they are surface-level mods. I think modding support should eventually be much deeper: custom army behavior, stances/commands, global abilities, research, AI personalities/strategies/tactics. Can you imagine how awesome it would be for some clever modder to come up with a way to effectively re-enact the final battle scene in Ender's Game with a rotating formation at the army level? Or build a set of units and strategies based upon stealthed units? And for it to work the AI has to be moddable to be able to make use of custom capabilities as well. Admittedly, what I'm asking for is a level of power that would allow modders to make the gameplay way different from your vision of Ashes. But that would light a fire of creativity that will keep the game relevant and interesting indefinitely. For me, the ultimate litmus test for the Ashes moddability will be the day someone can do a Total Annihilation or SupCom total conversion. True. It is in the RTS category, still. It isn't nearly the same as Ashes or SupCom or whichever, but it proves the RTS market isn't a small one. So you could control 7-8 individual fleets, each larger than 150 CP, as well as manage an empire of over fifty planets without losing significant amounts of time to busywork? 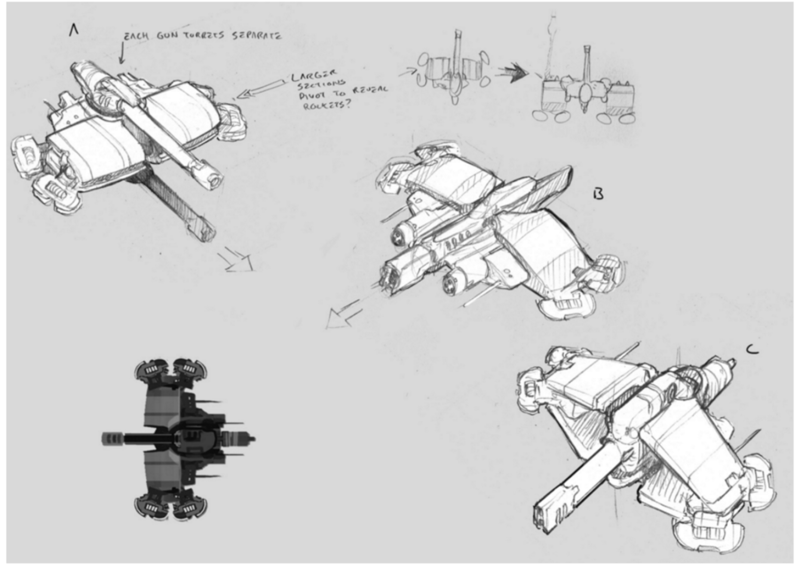 I don't think Ashes and Stelllaris are competing for the same market any more than Offworld Trading Company and EU are. You're reaching. Moreover, Stellaris is built on the Clausewitz engine that they have been building for 12 years and used on Hearts of Iron, Crusader Kings, EU, etc. It has nothing to do with tech vs. tech but rather the features of the engine. Being a 64-bit multiccore engine doesn't magically give the engine features. It merely sets its potential. Incidentally, Factorio is an RTS by your definition and it'll outsell them all. Frogboy/brad i have a suggestion for the upcoming third faction if there are gonna be one. Please read it and be inspired. i am just throwing and idea out and post. scenario: Humans becomes bio-enginnering beigns by using their own body, full of bio-cells, to create and replicate natures own creations on earth, but due to the leap of the singularity, these humans can create a eden out of a unhospital place and surpasse natures own creations (due to singularity). By just by using their own bio-cells to create new materials reusing natures own principals in terms of self-sustain-abilitys. (due to focus on heavy biotechnology), they are capable of shaping the very land around them self making them almost an avatar of nature itself. (imagen if a human coulde live and survive with just the the suns energy alone! its that type of scenario) that allows for impossible adaption to lifeless areas or planets by unusable, naturaly means. (its the idea i have for a third faction that uses nature as a tool, but due to the singularity events they can become planet shapers by using turinium to terraform a whole world and make it as habital as earth and diverse in its forms. (in order to create their own eden like, universe with many possible-abilitys. 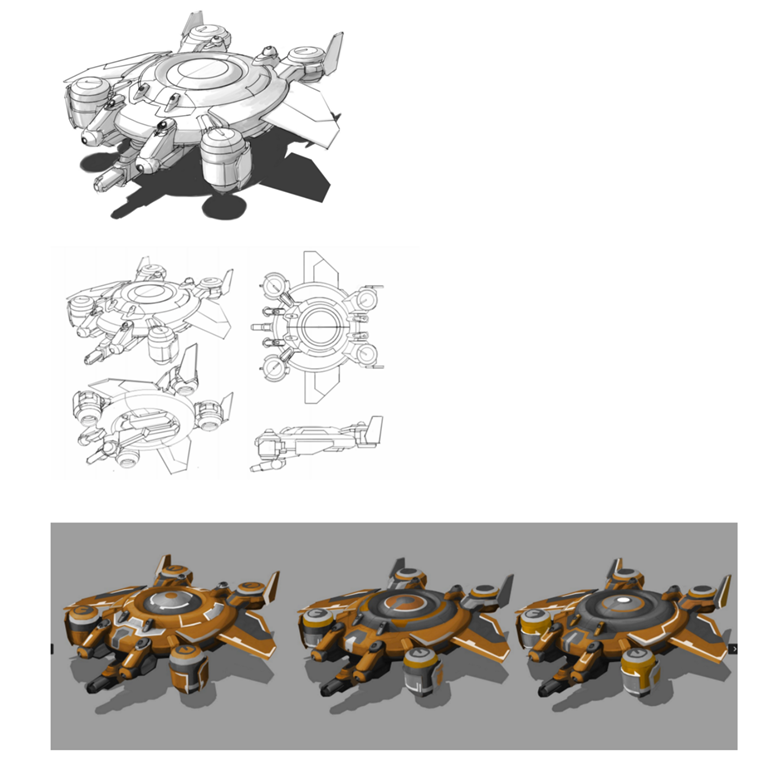 My best point of reference for good UI is Planetary Annihilation. Not so much on the large empire management front, but at the level of unit/building selection, issuing orders, building your base, handling your build queues, etc.. All quite nice. Nice enough that when I did go back to Supreme Commander after playing PA for a while, the drop in UI functionality was painful. Say what you will for PA, they did some things bad (technical issues galore for a long time), but they also did a lot right, and convenient UI is one of them. If I select multiple factories, my build orders should duplicate across them. I should not have to repeat a build queue across both, nor click repeat build on both. you dont need 7-8 fleets in sins lol silliest thing ive read...i am not korean and i find controlling a large fleet easy..and the ui is very helpful in finding stuff...personally it seems you might not be that good at macro. you should youtube stellaris blorg and watch the game plays...it seems a lot more slow paced...as frog mentioned eu in space...since your at it..want to mention how pretty call of duty looks compared to ashes? Frogboy, I am really curious, are those the only RTS games that you have played that you listed in the table you made? What made you pick those particular ones to compare AotS to? I see lots of notable RTS games are missing from your table, I know it would be impossible to list all games as shown here https://en.wikipedia.org/wiki/List_of_real-time_strategy_video_games so, just curious as to your criteria in picking those specific ones? those seem to be the more popular ones that's being played. in my opinion, Ashes deserves ATLEAST 80% positive reviews in its current state on steam, sooner or later more! 2/3. perfect summary, what a great RTS game needs! examples: Brutes could get armour/shields, archers could get more range, medics could get a second heal beam etc. how can we (the players) help you about the financial situation (something like kickstarter or patreon, but that would be an emergency plan!)? how can we/you innitiate a hype train like stardew valley currently has? anyways, i wish you luck with your game and would love to see Ashes become the best strategy game of the next years! I tried to pick the most popular ones within a particular sub-genre. Thanks Frogboy for this thread. Always love seeing the thought process in game development and the outreach to the community in making AOTS better for the ages. I like the idea made by RazzorLight above where we get more than one T4 to choose from but that the number you can build is limited through one mechanic or another. I like that there are lots of plans for improving the game. To improve sales I'd wait until you've done your big Campaign update into the game along with the medium ranged ballistic defence/anti-artillery building you've mentioned and some much needed UI quality of life improvements and then put the game on a 25%-30% off sale. You'd get more people getting the game and they are more likely to review it favourably too. No Age of Empires: Age of Kings Brad ? It is amazing the legs that game has. The HD version gets as many players on Steam as CoH 2, and if you throw in the voobly folks for the non-HD version it probably jumps well past it. Can we include Madden 16 as well? That is real time, and there is strategy involved in the play calling.